With my ambundance of lavender this year ,I am racing to make as many things that I can. I do like to leave some lavender out in my garden because it looks so pretty when it sways in the breeze. But I also feel guilty just letting it sit and not making anything with it. If you grow lavender, or if you can get your hands on some, I highly recommend making some lavender massage oil. Nothing relaxes me more than the scent of lavender; add a massage with that and I am one happy person! Enough lavender flowers to fill a medium sized mason jar. Organic carrier oil, use an oil that does not have a strong scent such as sunflower, avocado, or even olive oil. Fill jar with lavender flowers. To make it easy, I just snip off the tops of the lavender so it's still on the stem. Discard the remaining bare stems. Fill the jar with your choice of oil, making sure the lavender is fully covered. Seal jar securly and place on a sunny window sill for 2 weeks. After 2 weeks, drain the lavender oil through a fine seive. Pour massage oil into a dark glass bottle and store in a cool dark place. Woke up to another rainy day.. Oh well, at least my garden is happy! Gloomy mornings are the perfect time to bake. It's just dark enough where you have to have the kitchen light on. 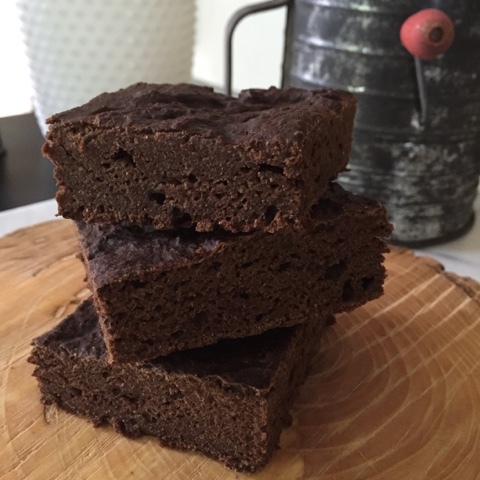 The aroma of baking brownies fills my home. Who cares what the weather is like outside? 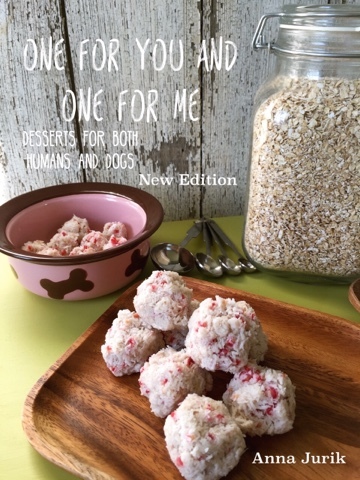 I'll soon have a scrumptious treat to enjoy! Line a 9"x9" square baking pan with unbleached parchment paper, set aside. Place all ingredients into a large bowl and combine thoroughly. The batter will be very thick. Spoon batter into pan, making sure to spread the batter into the corners. My lavender garden has exploded this year! I have lavender in the front of my home, on the side, and in my backyard. All three places are doing tremendously well. My lavender normally grows well but this spring and summer has been my most abundant year yet. My oldest lavender plants are15 years old and they are my pride and joy in my front garden. All of my other lavender plants on my property came from these mature purple gems. I have either transplanted young lavender plants when they have magically appeared, or I leave the young new plants to grow wherever they have reseeded on their own. 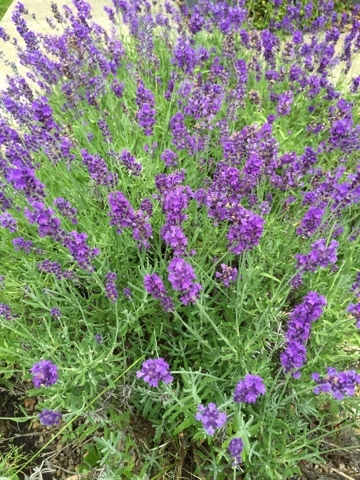 So far this year I have had enough lavender to make lavender massage oil, lavender water, sachets and still had plenty more to fill plenty of vases to brighten the inside of my home. Today, I made lavender salt for my sister. 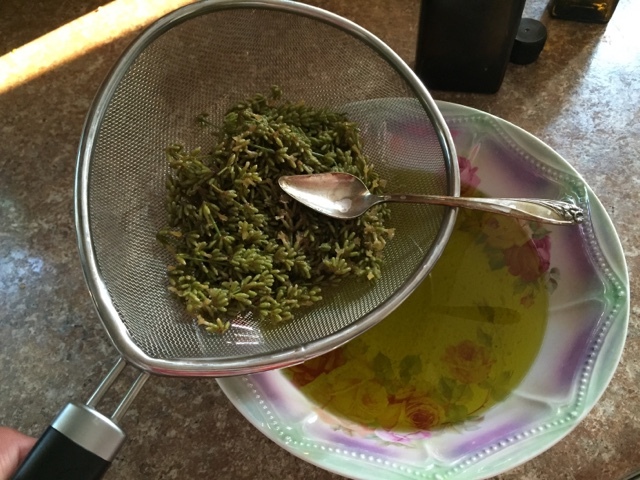 Place 1/2 cup of salt and lavender flowers in a food processor. Pulse 10-25 times, or until the lavender is well incorporated into the salt. Pour lavender salt into a medium sized bowl, stir in the remaining 1/4 cup salt. Store salt in a glass container that had a secure top. 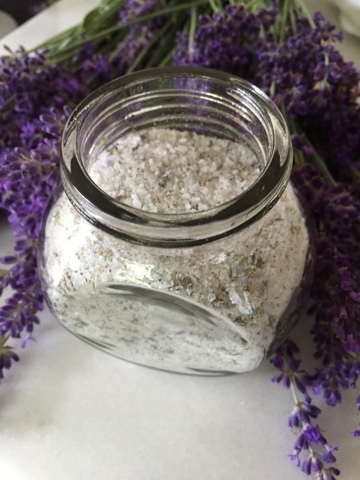 Use the lavender salt on veggies, or use to enhance the flavor of chocolate, when making cookies or homemade candy. 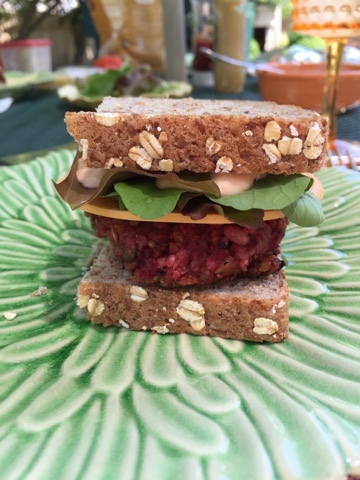 Most of the vegan burger recipes that I see use black beans. Nothing against the bean, but the beet beats the bean, hands down! If you're not in the mood for a hamburger, how about a patty melt? Or, instead of forming the mixture into patties, you can make crumbles for sloppy joes or chili. The possibilities are endless! 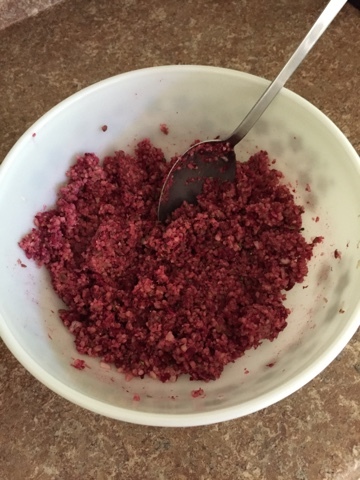 Place beets, brown rice, and lentils into a food processor. Combine until the mixture just starts to stick together. Place beet mixture into a large bowl. Add remaining ingredients and combine thoroughly. Place beet mixture into the refrigerator for 30 minutes. 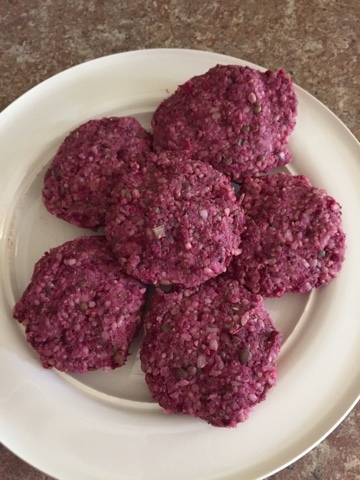 Form beet mixture into patties. 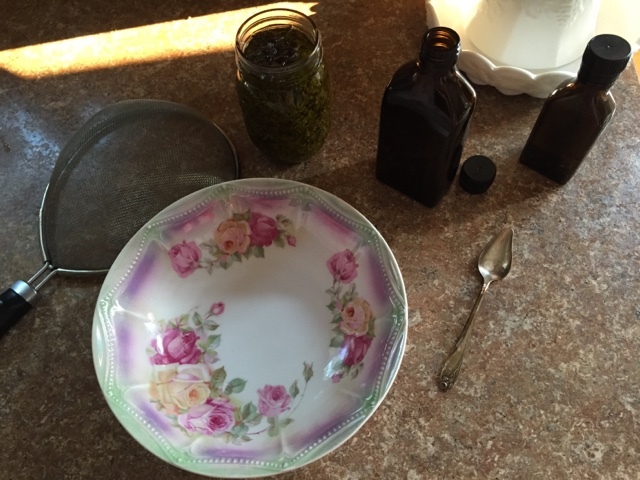 Heat oil in a large cast iron skillet. 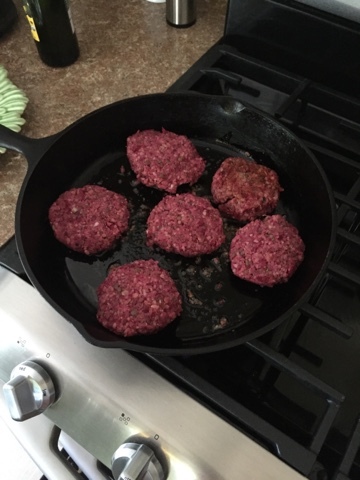 Place patties into the skillet and cook until lightly browned on each side. A rare thing happened today, I had over ripe bananas! You see, bananas don't sit around in our house very long. We mostly use them in smoothies everyday and for the quick snack as we run out the door. So, I had to make a pie with them, because who knows when this opportunity will come again! Place all ingredients into a food processor and process until a soft dough-like mixture forms. Place mixture into a 9" pie pan. Press crust so it evenly covers the bottom and slightly goes up the sides. Put aside and make filling. 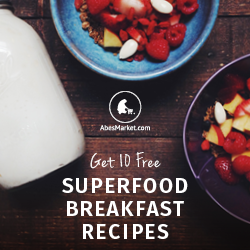 Place all ingredients into a high powdered blender and process until smooth. Pour filling into pie shell, smoothing out the top as needed. Place in the freezer for 2 hours before devouring! Garnish the pie before serving. 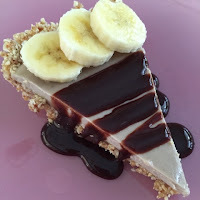 Place sliced bananas along the pie crust. Drizzle with syrup over a cut pie slice. You may keep the pie in the refrigerator if you have any left. I was getting myself ready for a 12 mile canoe trip and was inspired to create this drink with a bit of a caffeine kicker. For best results, cold brew the coffee in advance. Our recipe for cold brewed coffee is here. In a Vitamix or high speed mixer mix the ingredients in the above order from low speed to high. Spend 20-30 seconds on the highest speed. Enjoy! This post was written by guest blogger and waterman, Jeff.